This training involved acquisition of the most up-to-date techniques in Periodontics and Implantology under the expert supervision of Professor Richard Palmer who was appointed the first Professor of Implant Dentistry in the United Kingdom. 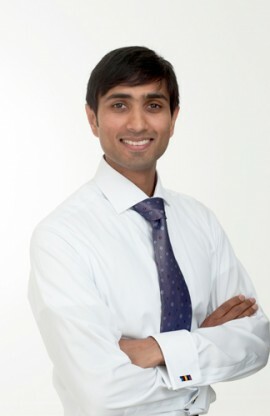 Amit then obtained his Membership in Restorative Dentistry from the Royal College of Surgeons of England and became a registered Specialist in Periodontics. He works with several different implant systems including Dentslply Implant and Straumann Dental Implant system which are the worlds biggest implant companies. He is also experienced in advanced surgical techniques for the treatment of Periodontal disease including sinus lift surgery, bone augmentation, the use of growth factor for bone regeneration and cosmetic root coverage surgery. Amit is dedicated to providing specialist dentistry at the highest level and to training other dental professionals. In his role as Associate Specialist in Periodontics and Honorary Clinical Lecturer at the University of Birmingham Dental School he regularly teaches at both undergraduate and postgraduate level. He lectures both nationally and internationally, has presented at several major international conferences and has published in the field of Dental Implantology and Periodontics. In addition Amit is on the Editorial Board for several journals and a key opinion leader for several dental companies including implant companies. He was recently invited to become a fellow of the Royal College of Surgeons of Edinburgh which was an honour for Amit as Such an award is bestowed upon only the very few and only in recognition of a significant contribution to their chosen field. Recently Amit has also been invited by Professor Giulio Rasperini of the University of Milan, Italy, to be part of his research group and be involved in periodontal, dental implant and bone regeneration research. Amit is also a key opinion leader for some major dental companies who are involved in implant dentistry, bone regeneration and periodontal and surgical instruments. Amit has also been invited to become a member of PEERS UK, an association established to provide insight and advice for the development and improvement of dental implants.